Otomedius Excellent is dramatically easier than bullet hell shmups, the swarms of bullets usually quite manageable. Setting the difficulty to Expert (necessary to unlock several characters) certainly increases the challenge as enemies fire a lot more, yet it never feels impossible to survive. Serious bullet hell fans may be put off by Excellent’s reduced need for memorization and superhuman reflexes, but normal people will have fun with it. Even the Achievements are within the grasp of regular humans. The only annoying one, ‘Top Gun,’ requires players to earn a score that takes about 4 hours of continuous gameplay to achieve. With the right settings it’s doable, but what an unfun thing to ask of someone. 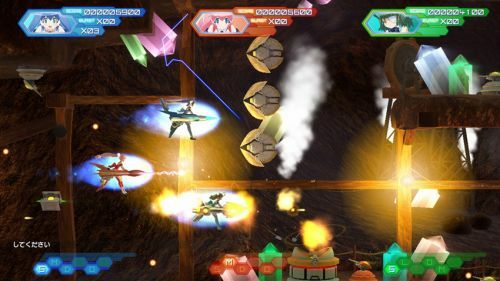 Whereas the first game only featured competitive multiplayer, Otomedius Excellent has both online and offline co-op for up to three players. I appreciate the addition of co-op, but its implementation leaves much to be desired. On the plus side, offline multiplayer lets players choose the starting level and wave, an important option when looking for unlockable weapons. Now the bad news: the second and third players get unlimited lives, but when the first player runs out of lives, the game ends. This means you’ll need to not only make the best player play as first, but he’ll also need to pick up most of the powerups and keep a force field going if you hope to get anywhere. Naturally, only the first player gains progress towards Achievements too. Local co-op also suffers from an annoying bug in certain levels. Whenever a level scrolls both horizontally and vertically, the second and third players can’t move past a certain height. If the first player scrolls the screen down, his partners will get stuck and disappear until the level returns to the standard height. This only happens a few times throughout the game, but it really shows how little thought and time the developers put into multiplayer. As if the local co-op wasn’t haphazard enough, online multiplayer fares even worse. When the second or third player dies, they are sent back to the lobby. Only when the host player reaches a checkpoint can the other players respawn. Should the host run out of lives, the game simply ends. How could anyone botch co-op so badly in a shmup? Perhaps the guy who designed Excellent’s multiplayer component resented being forced to include it so much that he intentionally sabotaged it. Otomedius Excellent is something of a budget release, with simplistic but adequate 3D graphics and the aforementioned lack of English vocals. As such, it comes in both a value-priced standard edition ($29.99) and a special Collector’s Edition ($49.99). The Collector’s Edition includes the standard game case, a 2-sided pillow case, art book and CD soundtrack, all housed in a flimsy (but pretty) cardboard box. 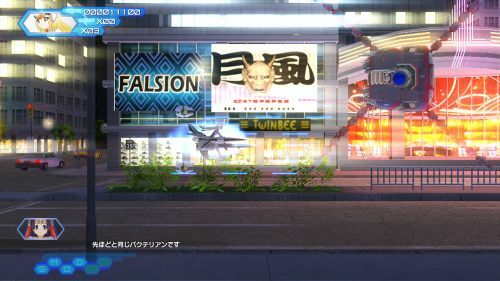 The book contains a variety of production art from both Otomedius games, whereas the soundtrack’s 37 songs are mostly taken from Gorgeous rather than Excellent. If those items sound good to you, go for the nicer edition. Shoot-em-ups are a rare breed these days, with non-bullet hell ones practically extinct. That alone makes Otomedius Excellent something special. The cute, distinctive character designs and abundant Konami references lend the classic gameplay some extra charm. I wish the developers hadn’t botched the multiplayer so severely, making it difficult to recommend Excellent as a co-op game. But if you love side-scrollers and don’t mind flying solo, it’s still a must-buy. The Co-Op Experience: Play with up to three players on one console or via Xbox Live. Set the starting level, wave, and difficulty, and then do your best! If the first player runs out of lives, it's game over for everyone. In online games, players two and three must wait for player one to reach checkpoints before they can respawn. Page created in 0.8125 seconds.